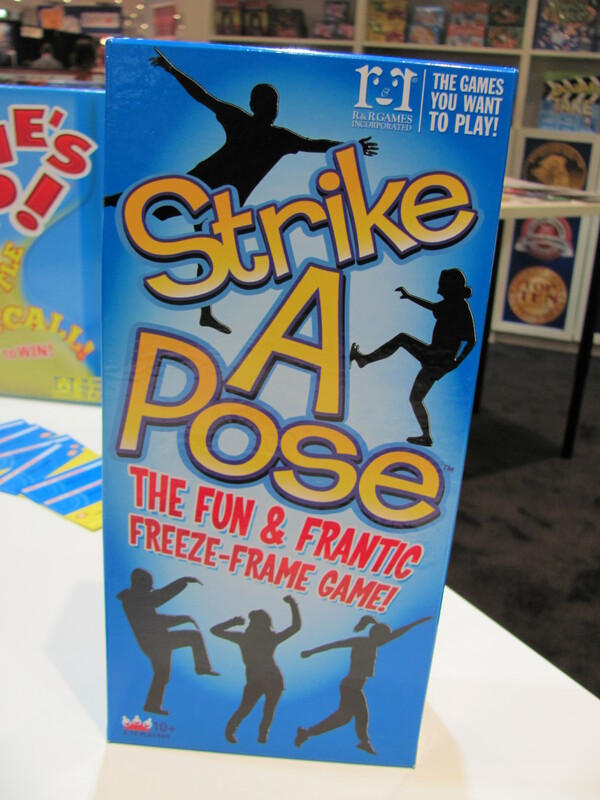 Last year R&R Games debuted for the American market Hanabi, which went on to win the Spiel des Jahres award. 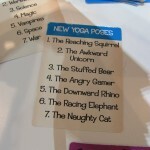 Will any of these repeat the feat? 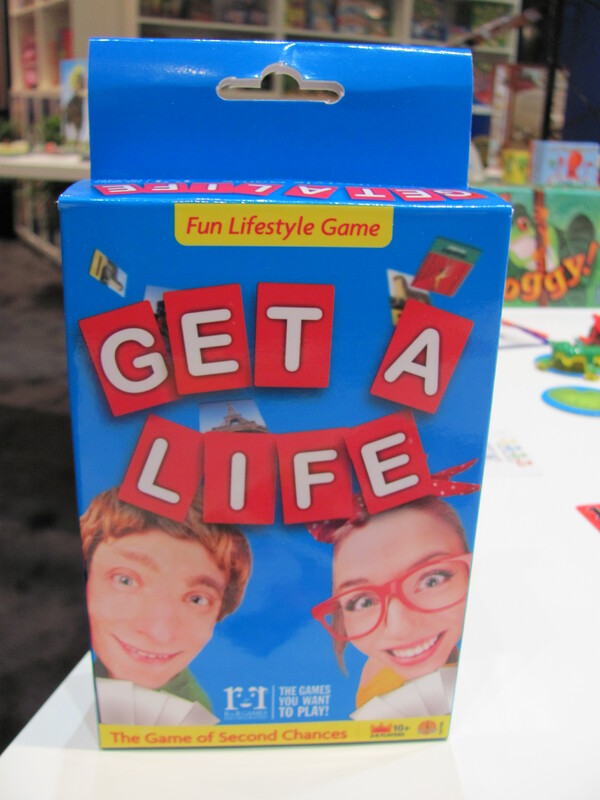 Get a Life ($12, available April) is a party game in which players assemble companion, accommodation, occupation, transportation, and location cards for either the best lifestyle or the worst. 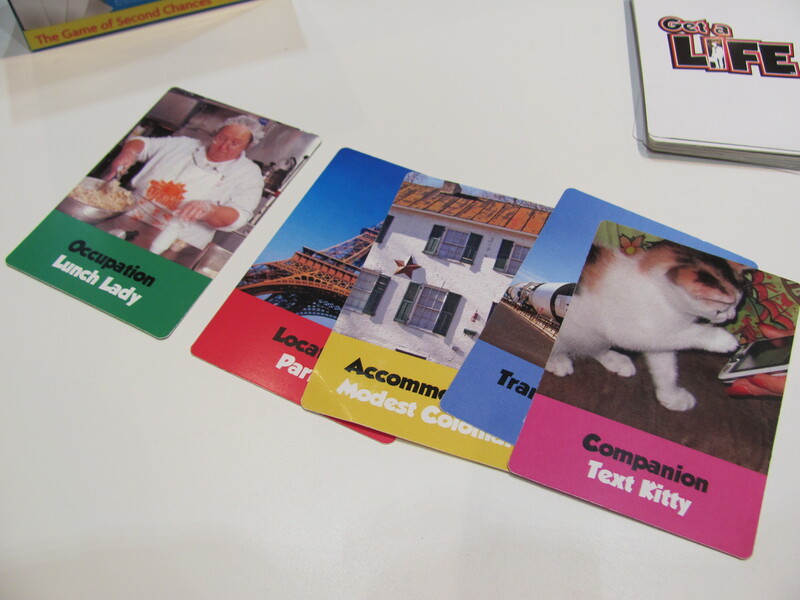 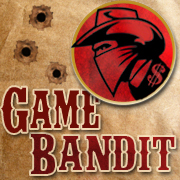 The thing is only a portion of a player’s cards are laid on the table, and also action cards allow players to steal or trade cards with each other. 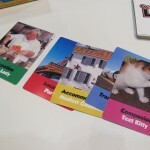 Thus, it can be a surprise when a player that appeared to be aiming for worst lifestyle ends up capturing best. 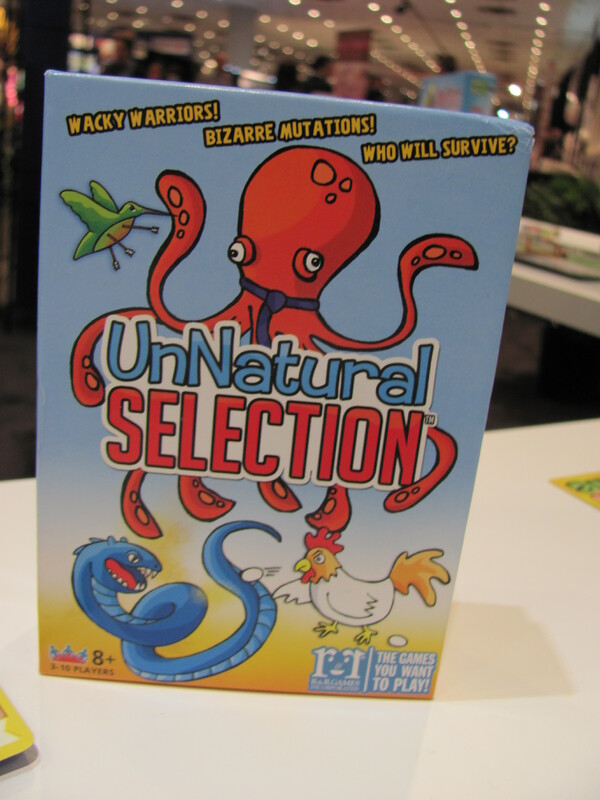 The cards that comprise UnNatural Selection ($11) have both contestant and attribute aspects. 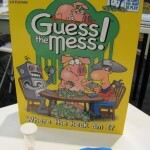 The contestant is a type of creature (e.g., hippopotamus and minotaur) and the attribute a wide range of adjectives (e.g., gassy, wearing a clown costume, and academic). 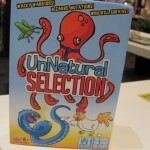 Each round, players submit creatures of theirs to compete in a new contest (such as “winner of a potato sack race” or “fastest sausage stuffer”). 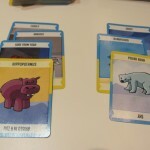 Then they use their remaining cards to attach attributes to their and their opponents’ creatures. 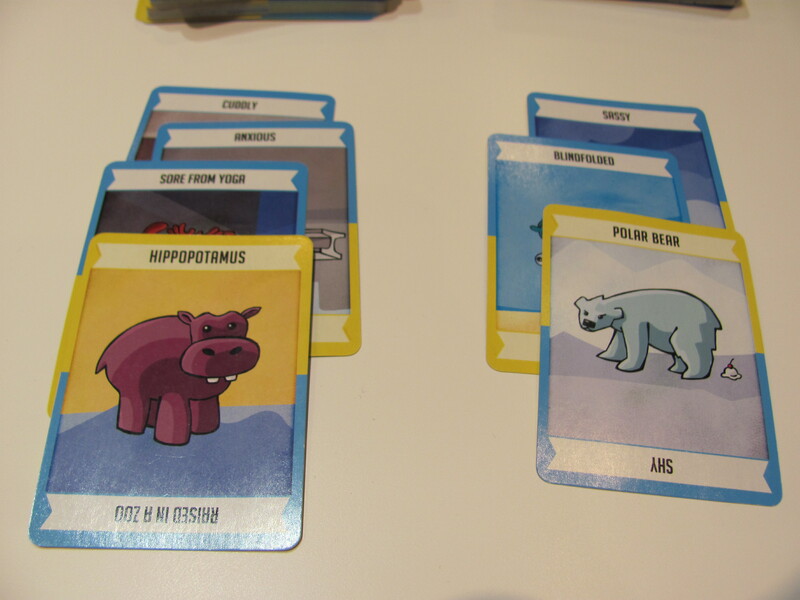 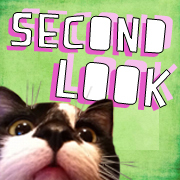 When all cards are played, the player who’s turn it is to judge that round, must choose one creature as the victor. 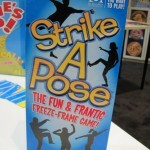 Strike a Pose ($20, available April) is a Charades-like action party game with a fashion theme. 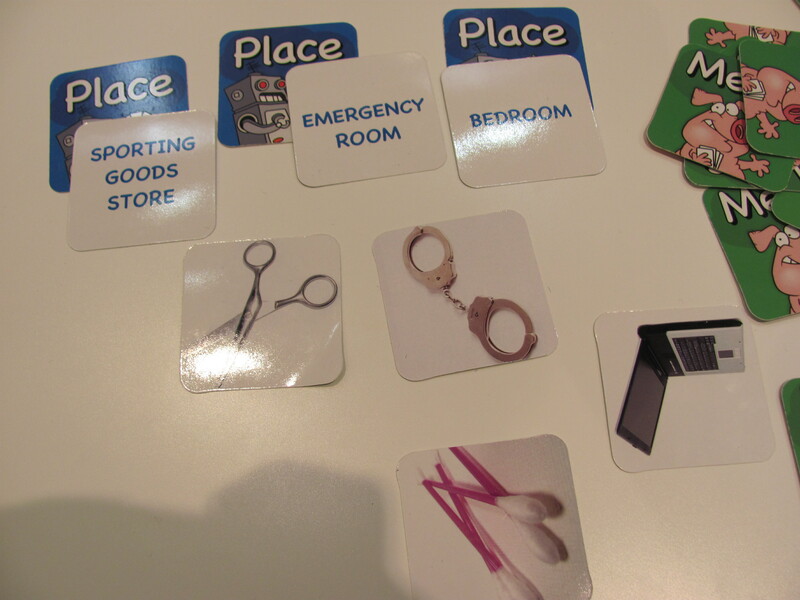 Players are supposed to pose in ways that represent clues within a category. 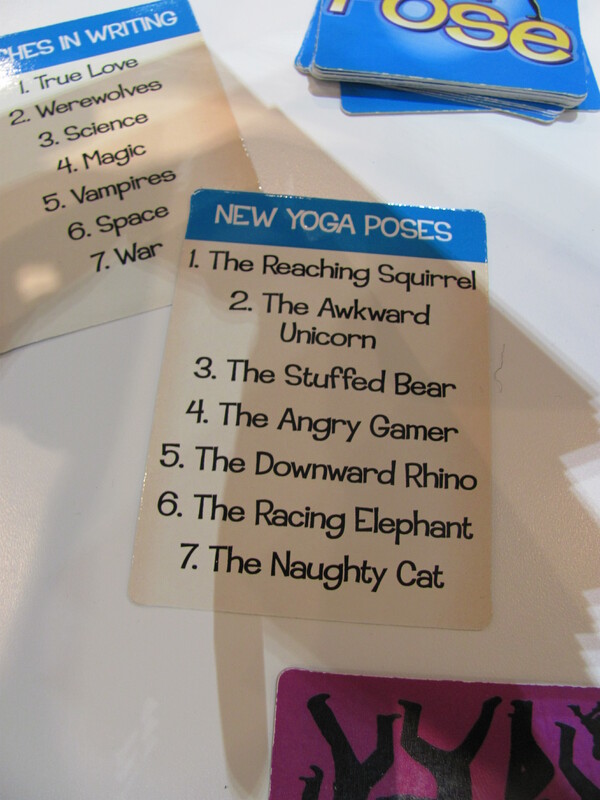 For example, the Yoga Poses category includes “The Awkward Unicorn” and “The Angry Gamer”. 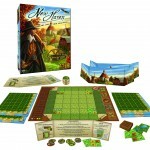 The Trades category includes “Cook” and “Shepherd”. 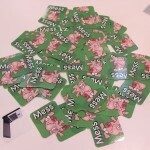 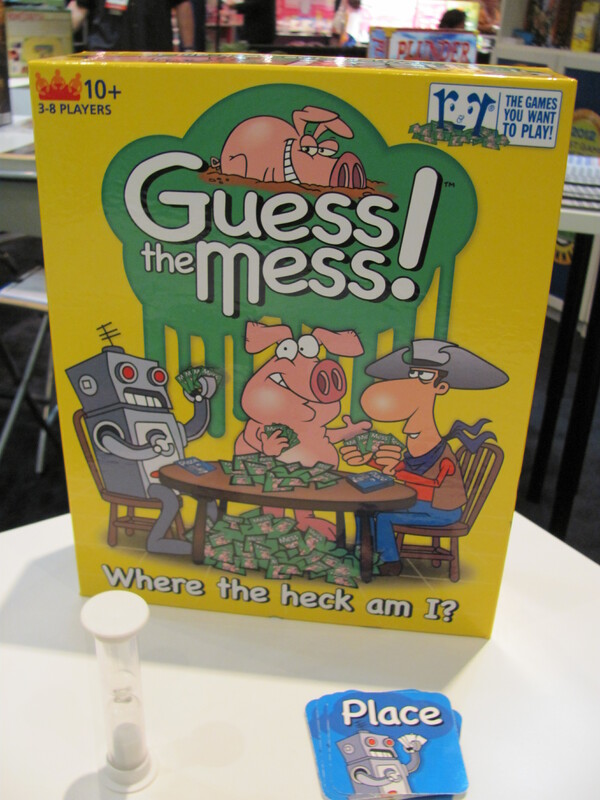 With Guess the Mess ($20, available April) players make a messy pile of item cards, then have 30 seconds to grab as many items as they can that fit a location card. 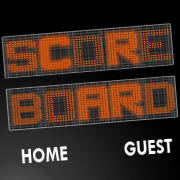 But that’s not the end. 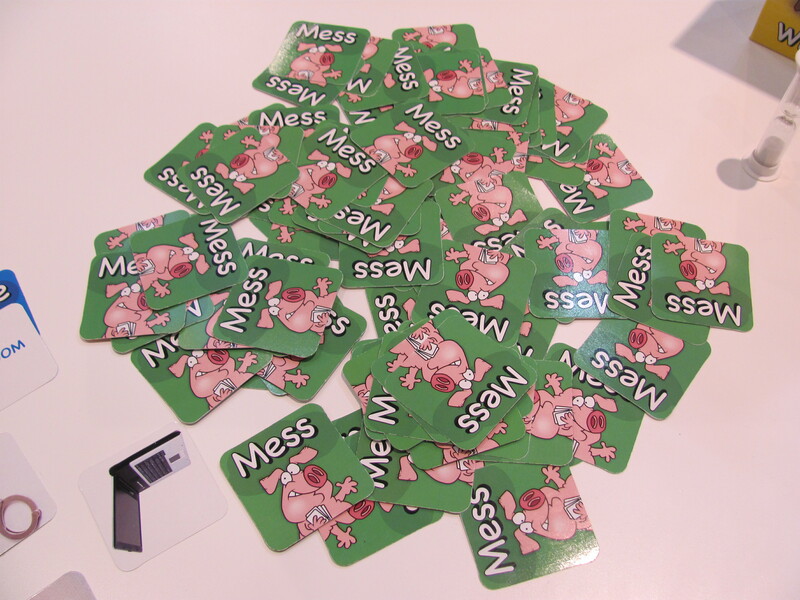 When the timer runs out, players pass their collected cards to each other and try to guess which of the locations was the intended fit. 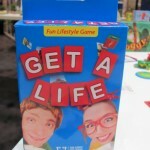 For example, do worms, chocolate, bullets, and scissors go in a bedroom or desk? 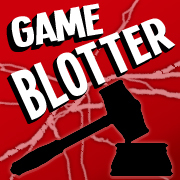 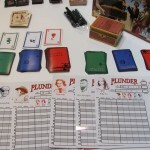 Plunder ($25) is a detailed deduction game with a pirate’s hidden-treasure theme. 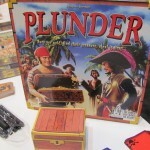 The goal in Plunder is to figure out on which island, at which marker, and protected with what trap is each other pirate’s treasure. 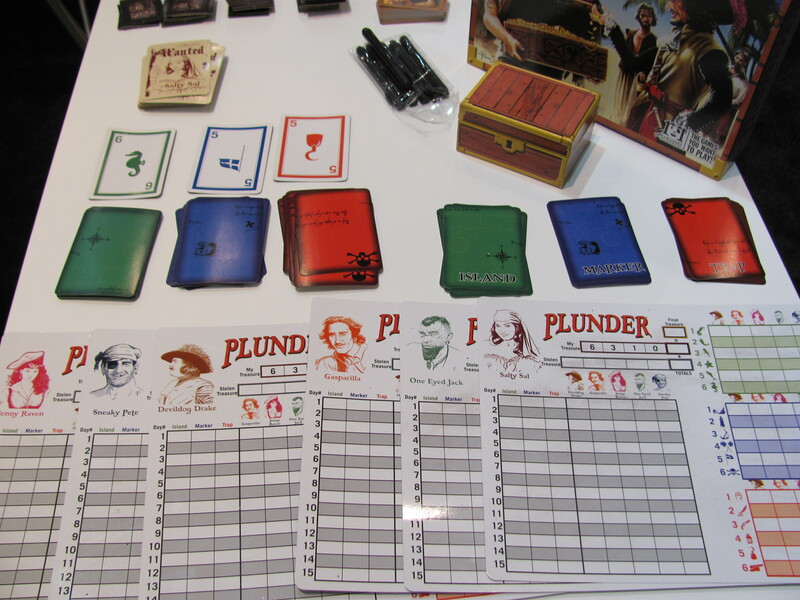 As players draw cards, ask questions, and narrow the possibilities, they take notes with dry-erase markers. 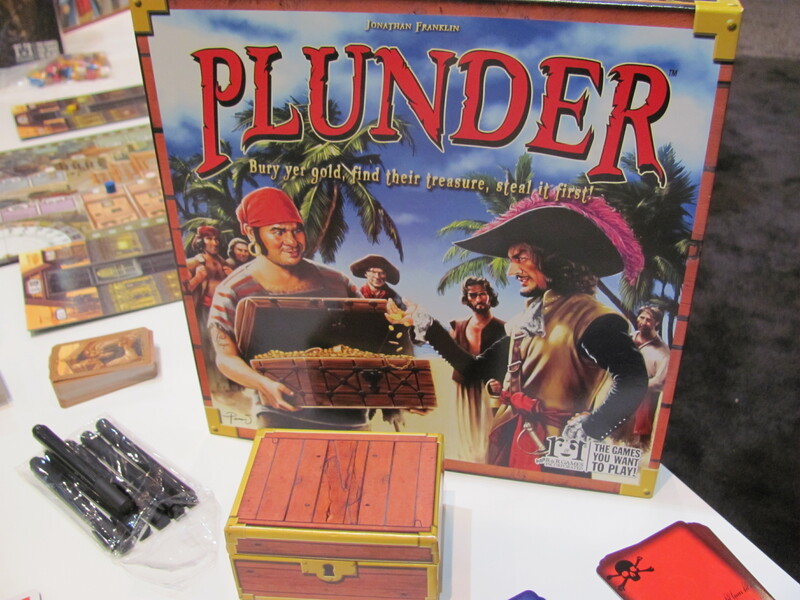 Cards marked with guesses are placed in a treasure chest. 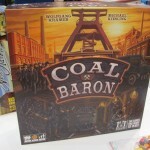 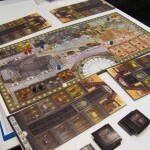 Coal Baron ($45) is a worker-placement game about mining set in the late 1800s in Essen, Germany. 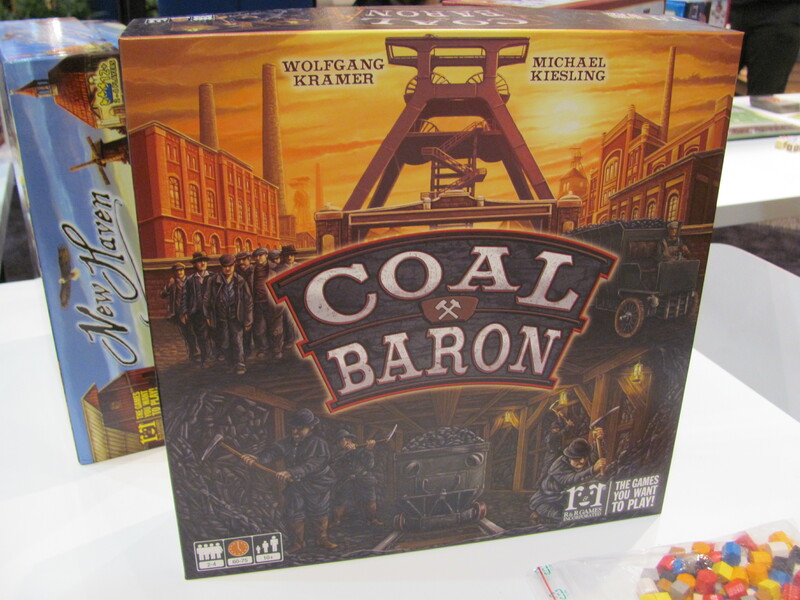 For victory points, players need to fulfill contracts for particular types of coal. 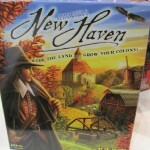 To get at that coal, though, they’ll first need to expand their mine tunnels and purchase coal carts. 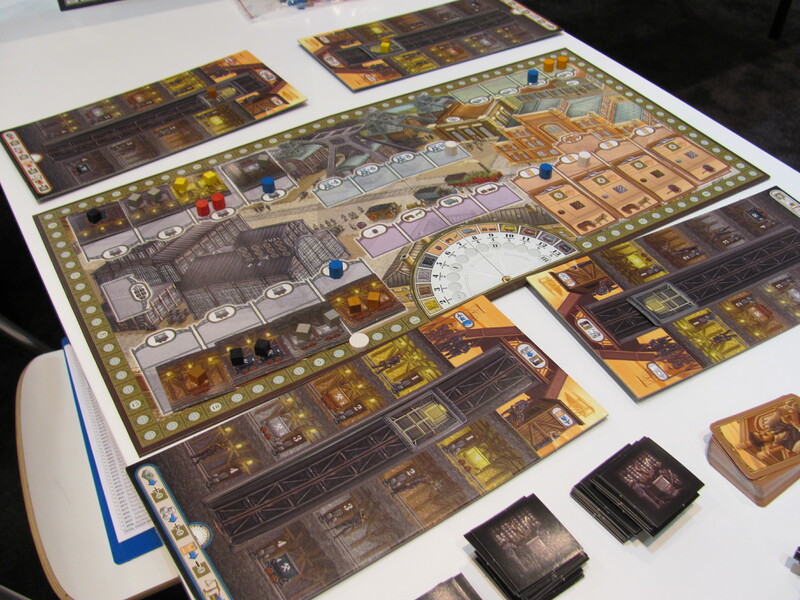 But the longer they delay at sending workers to mine, the more workers it will take to extract the needed coal. 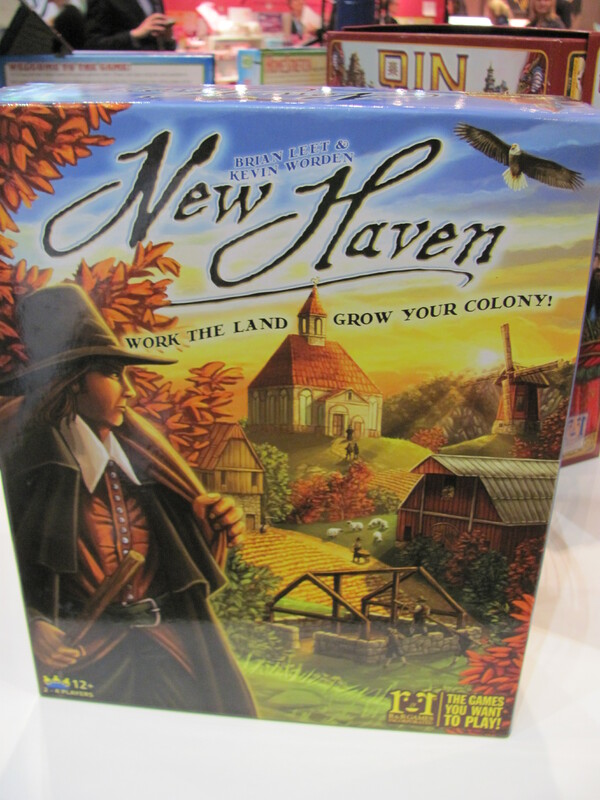 Combining tile-placement and resource-management, New Haven ($40, available April) has players building villages in a New World colony. 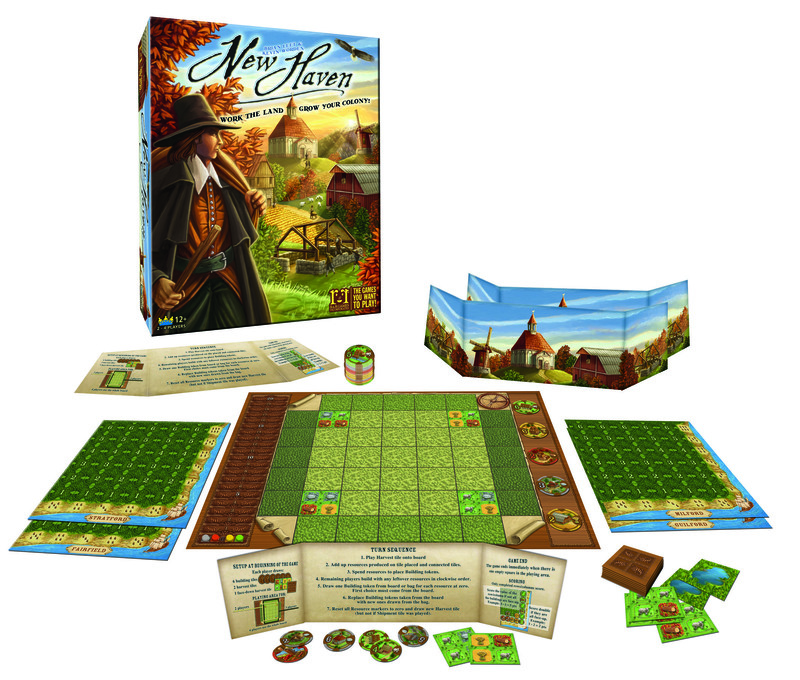 Stone, sheep, wheat, and timber resources are collected through the placement of tiles, and then used to attract tradesmen, build amenities, and entice more colonists. 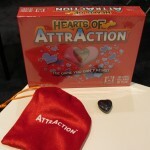 Hearts of AttrAction ($20) is mostly alternative packaging to AttrAction. 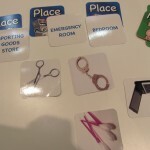 The rules are the same. 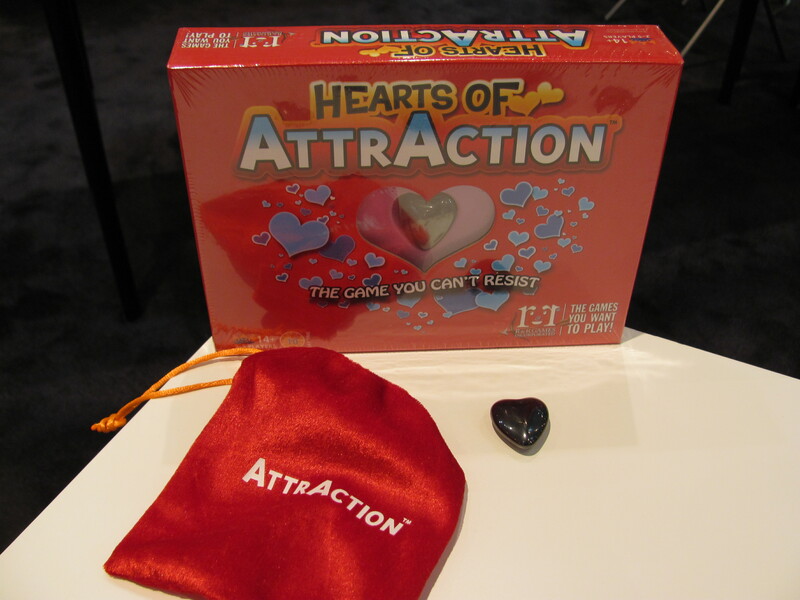 The main difference is that the magnetic pieces are heart-shaped, which R&R reports make them more active.